If Bloodborne deserves to be remembered for anything, it’s the meticulously crafted geography of its first half. Those opening hours take players on a journey through some of FromSoftware’s best designed levels, beginning in the intricate Victorian hellscape of Central Yharnam before winding up toward the Grand Cathedral at the city center and beyond to the wooded frontiers outside the city gates. The journey ends at Byrgenwerth, a locked-away mansion full of terrible eldritch secrets. It’s a memorable trip for a lot of reasons: complex locations that loop back around on each other, distinctive and dangerous enemies, and the slow trickle of story information as the trip ekes toward its conclusion. 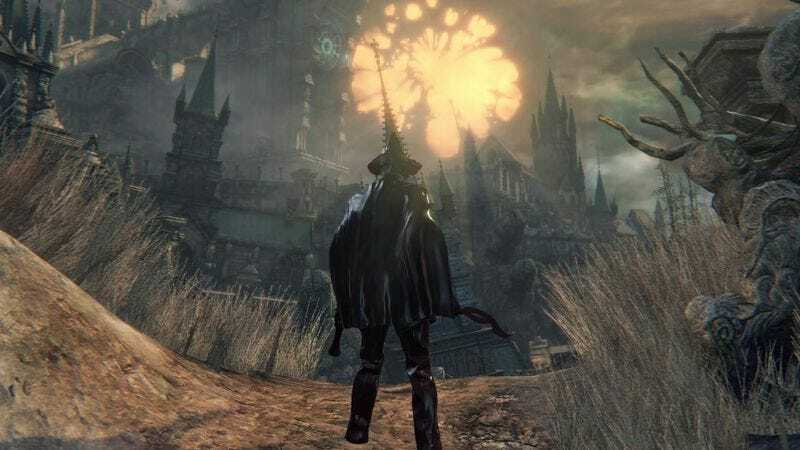 If The Old Hunters, Bloodborne’s first and likely only expansion, deserves to be remembered for anything, it’s the manner in which it replicates and doubles down on that original structure. FromSoftware is a developer that has become known for its use of homages to past titles—the newer Souls games referencing and rehashing elements of the older ones. The Old Hunters is the best version of that tendency, a masterful remix of the strongest parts of Bloodborne, intensifying them and changing them just enough to reveal new terrors and challenges within that old structure. It begins in a place called the Hunter’s Nightmare. It seems to be a type of purgatory for the beast hunters that make up most of Bloodborne’s heroes and villains. Once they become feral with bloodlust, a mysterious force drags them here. You enter as an explorer of sorts, looking for whatever secrets the nightmare holds. Like in the main game, there’s a sense of tumbling, sinking deeper and deeper into a pit of Lovecraftian alterity. From there you re-enter the Cathedral Ward section of Yharnam, or at least a version of it. It’s a half-remembered, hallucinatory version of Bloodborne’s early haunts, with tendrils of rock and stone pressing out of the ground as if some hideous thing is exerting pressure on it from the world’s core. This place is populated with blood-drunk hunters and revised versions of some of the game’s most difficult enemies. Fighting through this area gives a glimpse into the earliest beast hunts in Yharnam’s fictional history. They were not pretty. The expansion’s later areas are less direct riffs on vanilla Bloodborne’s environments, but they replicate that early journey, expanding the motifs of discovery and frontier terror as you uncover the things that even the bloodiest hunters fear in the night. With the old hunters comes the old technology, too, in the form of lost weapons and equipment designed to aid in the hunt. There are great cleaving whips made of sawblades, greatswords channeling the power of the moon, and a massive iron implement called—delightfully—the Boom Hammer. Bloodborne has never been shy about embracing the potential joy in its carnage, offering the player a variety of transforming weapons to modulate the combat. The weapons here are some of the most creative and varied yet, revitalizing the gory chore of beast killing. Each new trick weapon feels like a crueler cousin of one of the originals, nestling into the expanded history of the world that The Old Hunters provides. This is the hunt as it’s never been before, but yet as it’s always been—FromSoftware turning over the crystal of its well-worn combat until the bloodied light flashes in a way that surprises. Somewhere around the middle of The Old Hunters, the player reaches a clocktower replete with bells. This is a new touch. Bells are a common motif in Bloodborne, used to access multiplayer and reach into the arcane, but they’ve always been unmoored, with no clear origin point, no reason to exist. Here, though, they seem to have a home, and even though this tower exists in the depths of a nightmare, it’s easy to imagine that there’s a real clocktower somewhere in Yharnam like it. Upon entrance, amidst the bells, you encounter, well, someone you’ve seen before. Like the bells, though, they’re different, given home in a new context. It’s an illuminating moment, a gasp of insight that makes every challenge leading up to this point worth it. But they don’t recognize you the way you do them, and, as encounters so often do in these games, the interaction goes from zero to murder in no time. The Old Hunters provides new riffs and deeper context to all the best, most memorable ideas in Bloodborne. The boss fight in the clocktower, too, completes a motif, this one in the form of a lesson. As this familiar figure rushes at you, intent on your demise, wielding a weapon you’ve never seen before, it’s never been clearer: In Yharnam, knowledge can’t save you. But a trick weapon might.